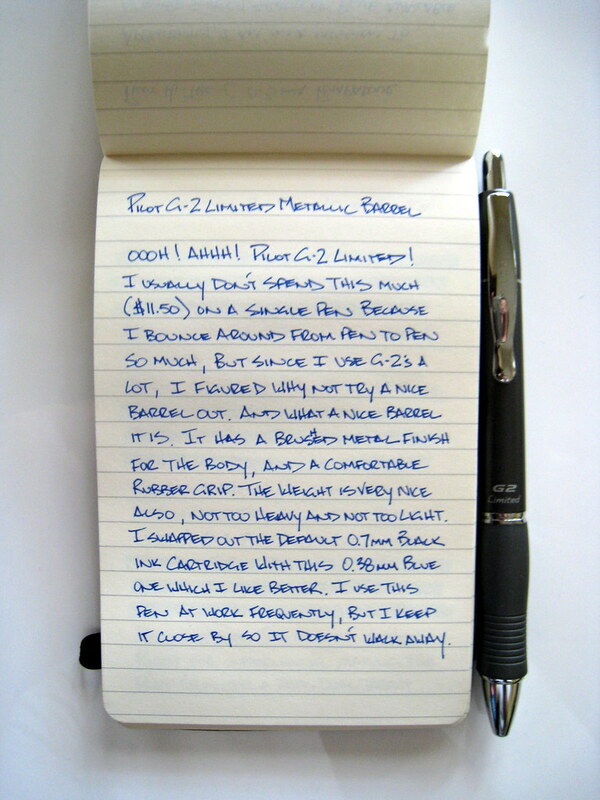 There is not much new ground to cover with the performance of the Pilot G-2 gel ink cartridge, but this Limited Edition barrel is a very nice addition to the G-2 line. I am normally hesitant to spend more than a few dollars on a single pen since I buy so many, but the color caught my eye, and I knew I would be able to add in an 0.38mm cartridge to replace the standard 0.7mm. The feel and weight of the barrel is fantastic, and the rubber grip is holding up nicely with a lot of use so far. I paid $11.50 for this one from JetPens a month or so ago, but I have seen all three colors in Target recently for $9.99, so put this G-2 Limited Edition on your shopping list if you are in the area. Posted on August 14, 2008 by Brad Dowdy.